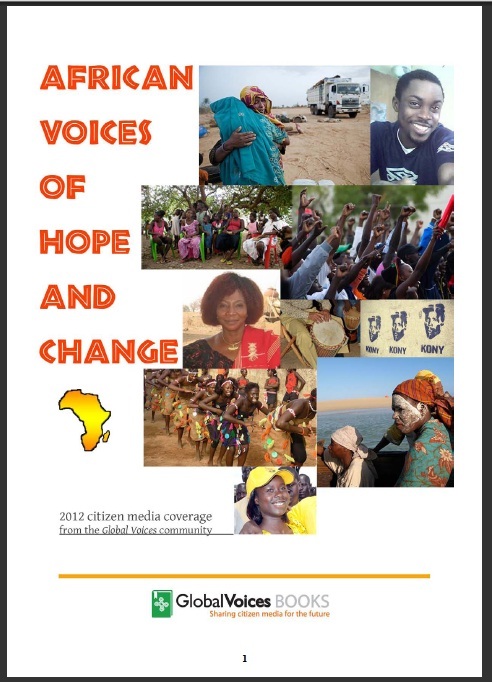 Hand-picked from the 2012 Global Voices coverage of the Africa’s Sub-Saharan region, this collection of stories is focused on Senegal, Uganda, Mozambique, Guinea-Bissau, Ghana, Ethiopia, Nigeria, Mauritania, Kenya, Angola and other countries. Thanks to Mohamed Adel for technical support and to those who variously contributed to articles selected for this e-book: Afef Abrougui, Ahmed Jedou, Anna Gueye, Eleanor Staniforth, Endalk, James Propa, Kofi Yeboah, Lova Rakotomalala, Nwachukwu Egbunike, Richard Wanjohi, Sara Gold, Sara Moreira, and Ndesanjo Macha. Now you can find this e-book (along with any future GV e-book) on Scribd, Issuu and the Internet Archive — spread the word! Comments and suggestions are always welcome. And to learn more about each format and their device-compatibility, check here for Mobipocket and here for the ePub. I am planning to sent this e-book to my former colleagues who have vested interest to Africa…well done and thanks.